Parsons Green is an above-ground London Underground station on the Wimbledon branch of the District line that opened in 1880. It is between Fulham Broadway and Putney Bridge stations and is in Zone 2. There are entrances on Parsons Green Lane and in Beaconsfield Walk. The station is a short distance north of the green itself. 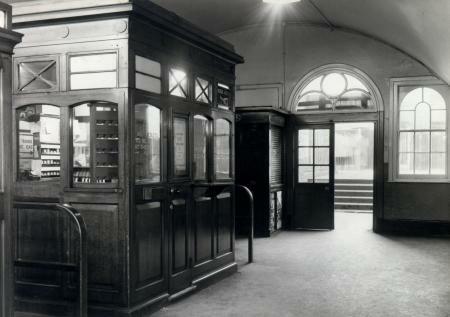 It was previously a train-operator depot, until functions were transferred to Earl's Court. Designed by a Mr Clemence under the supervision of John Wolfe-Barry, the station was opened on 1 March 1880 when the Metropolitan District Railway (now the District line) extended its line south from West Brompton to Putney Bridge. Parsons Green was a proposed stop on the Chelsea-Hackney Line. Known now as Crossrail 2. It would have either supplemented or replaced the existing District line service on much of the Wimbledon Branch. 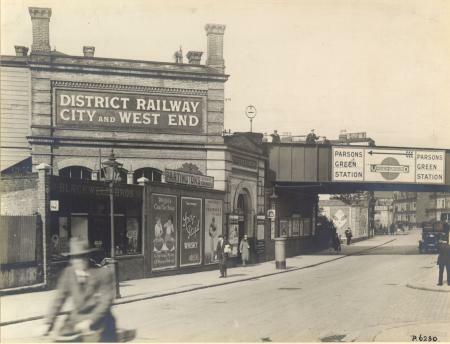 North of the station, the line would have branched off into a new tunneled section that could carry it into Victoria station, via a new station on the Kings Road, Chelsea station. Crossrail 2 will be built to National Rail standards and will go to Wimbledon via Clapham Junction instead. The route was safeguarded in 1991 and again in 2007. On 15 September 2017, around 8:20am BST, an explosion inspired by ISIL on a train carriage at the station injured 30 people. No fatalities were reported. The explosion was treated by the Metropolitan Police as a terrorist incident. The attacker, Ahmed Hassan, was tried for attempted murder in March 2018. He was convicted and sentenced to life imprisonment and must serve a minimum of 34 years. On 6 April 2019 it was announced that Lt. col. Craig Palmer, a passenger on the affected tube train, had been awarded the Queen's Commendation for Bravery for his part in helping to bring the bomber to trial and conviction. Two sidings west of the westbound, also accessible from the westbound platform. There is a siding just behind the westbound platform, which could only fit a C Stock train. As C Stock trains are no longer in use on the system, this siding is out of commission. ^ "Parsons Green: Explosion reported on London Tube train". BBC News. 15 September 2017. Retrieved 15 September 2017. ^ Rawlinson, Kevin; Siddique, Haroon; Dodd, Vikram (15 September 2017). "London tube explosion: District line 'bucket bomb' was terrorism, say police". The Guardian. Retrieved 15 September 2017. ^ Minelle, Bethany (7 March 2018). "Parsons Green accused Ahmed Hassan 'used school prize to buy bomb materials'". Sky News. Retrieved 10 March 2018. ^ Cobain, Ian (23 March 2018). "Parsons Green tube bomber Ahmed Hassan jailed for life". The Guardian. Retrieved 23 March 2018. ^ Aamna Mohdin (2019-04-06). "Soldier who rushed towards Parsons Green bomb given bravery award". the Guardian. Retrieved 2019-04-06. Wikimedia Commons has media related to Parsons Green tube station. This page was last edited on 6 April 2019, at 23:23 (UTC).